Something that is (slowly) becoming a trend, but still offers a unique impression for your guests, is your very own tailor-made wedding website. It is a platform which would showcase your engagement photos and story, the wedding date, time, location and any other need-to-know information. You can also include cute quirks like a wedding day countdown or a short biography of you and your SO. Whatever it is you want, you can make it happen – with the help of a few local experts. There is an increasing number of companies which specifically cater to wedding website packages. Creating yours is an extremely fun and interesting task, and is also a great way to spend some quality time with your other half. Shift events in Cape Town offers three different packages (Standard, Advanced and Bespoke), each including a set of services and quirks your website could offer. You can even organise to send your invitations online, have guests RSVP, and even allow your guests to book their accommodation. This is an affordable online wedding invitation site which also offers multiple packages for you to create the perfect wedding couple’s website. With many features and custom designs to choose from, and a communication system that sends out SMS alerts, you are sure to have everyone gushing over your big day. 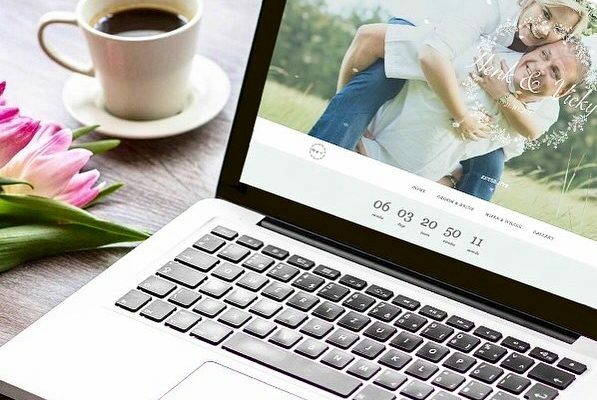 Stunning creations come to life with The Wedding Website, a business dedicated to creating timeless and elegant web pages for brides and grooms to showcase their special day. You will have the opportunity to showcase your engagement, bridal party, add details about your gift registry, and to share all your hopes and dreams with those you love through a unique website. If you are looking for something simple, My Big Event offers a standard package with add-ons so that can pick and choose all the stunning features you want to include on your website. Besides the staple RSVP option, images and wedding information, they also offer adorable free printables for guest lists, save-the-date cards and mini wedding planners. If you’re not in the market for something too extravagant, and if you have the time and are feeling creative, you can create a website yourself through free options like WordPress or WIX (which has wedding website templates on hand). It will be a challenge, but a great opportunity to learn a new skill and to save some bucks while still adding vision to your site.